Mission Statement ~~We conduct service projects on Hopi Indian lands and other northern Arizona locations in support of cultural continuance, self-reliance, self-esteem, self-empowerment and maintaining life in remote lands far from the economic resources of the modern world. as we share in respect and friendship, valuing diversity, we all learn from each other in this great circle of life. Services and Projects Our main projects is to provide practical support for Hopi families that help them keep going with their traditional life such as taking supplies for ceremonies, food, construction materials for home repairs/additions that enhance health and sanitation. We have our annual Hopi Holiday gifting project in December. We also support Hopi Foster Care. We effective Hopi initiatives to increase sustainable and healthy food such as Hopi Tutskwa Permaculture and Natwani Coalition's work with restoring Hopi farming and healthy eating. 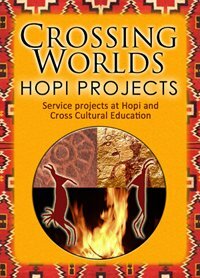 Our other project is to provide support for Hopis to come to the Verde Valley for cross-cultural sharing, ancestor sites field trips and other arts and culture events. Coal is the main source of heat for Hopi families, many of whom do not have vehicles for hauling the coal from the mine which is a 2-hour drive away. Firewood is also required to ignite the coal. Hugh Hoglan is helping Hopis in need with hauling both firewood and coal in his truck and trailer he purchased for this project. Hopis provide labor and some of the gas costs, but donations are needed to purchase the firewood, help with the coal mine fees and other hauling costs. We thank you for considering helping these families in need. Hopi Foster Care has on-going need for the youth they support for hygiene supplies, school supplies, folding beds and bedding. We invite you to order and ship directly to them or donate funds which we will dedicate to this on your behalf. Your support is greatly appreciated. Please email us for more details. Your donations are gratefully appreciated to support purchase of hygiene and school supplies, beds, school uniforms, and more to support Hopi foster care children. Hopi Social Services and the youth appreciate this support. Friends of Hopi Families project. We welcome sponsors to provide one-time or monthly support for Hopi families. Our goal is to make monthly deliveries of food, supplies, school or other needed items to provide much needed support for some of the traditional families having challenging times. You can do a recurring Paypal donation or mail supply boxes directly.